A mainstay in the Italian-restaurant scene for nearly 40 years, John Mineo's serves up classic Italian fare in an upscale setting. Lunch includes salads, sandwiches and pastas along with a few entrees, while the dinner menu expands to include a large selection of veal, steak and chicken entrees along with seafood and pasta dishes. 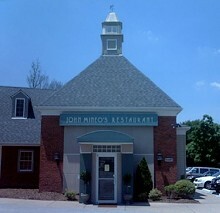 John Mineo's also has plenty of rooms for private events.